View our available legal job openings here. Your career is a marathon and not a sprint. We know that each attorney’s talents, career aspirations and personal circumstances evolve over time. We also know that our clients want a broader set of skills in client service, matter team management and more innovative business-centric approaches and efficiency, in addition to technical law expertise. 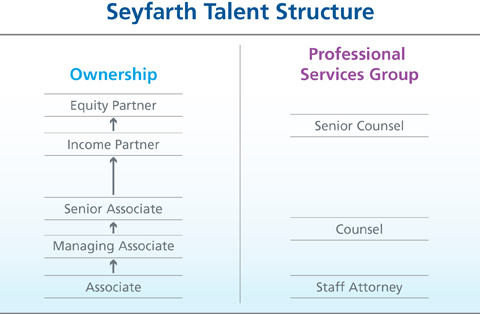 Seyfarth’s talent structure weaves these seemingly disparate needs into a progressive approach by stepping away from the “tried & true” lockstep model and offering more customized career options. The Firm is, thus, able to support those who enjoy the challenges and rewards of an ownership career path as well as providing alternative career options. Associates. Clearly-defined competencies convey expectations and provide a roadmap for success. We recognize that talented people don’t acquire expertise by class year. Some develop at accelerated rates; others need to hone skills and techniques. Associate compensation and advancement are tied to each individual’s merits as opposed to the constrained lockstep model. Associates are groomed for partnership through a variety of learning/training methodologies, mentoring from an assigned partner, formal and informal feedback and other opportunities tied to the Firm’s and practice group’s strategic initiatives. Income Partners. Similar to associates, income partners benefit from a set of competencies designed to prepare the income partner for elevation to equity partner. Income partners are assigned an equity partner coach and receive both formal and informal feedback. Emphasis is placed on refining the skills and approaches associated with driving client value, practice growth as an owner as well as legal excellence. Professional Services Group. A refreshing alternative for highly skilled attorneys is the professional services group, which tailors arrangements according to each attorney’s legal skill level, their desired time commitment and overall total contribution aspirations. 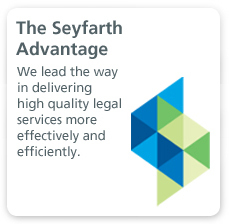 Working in concert, the Seyfarth talent model clearly defines factors for success, rewards our stars, provides greater career flexibility and allows us to retain and develop high-quality, well rounded attorneys. 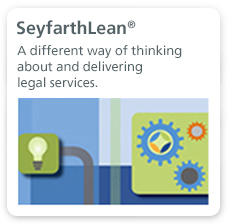 Search Firms and Placement Agencies: Legal search firms that have a current written fee agreement in place with Seyfarth Shaw are welcome to submit candidates for open positions unless our job position stipulates otherwise. We will not accept resumes from agencies with whom we do not have a current written fee agreement. 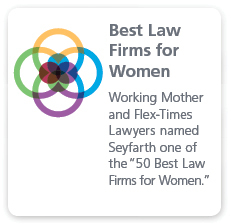 If you represent a search firm and would like to work with Seyfarth in the future, please reach out to one of our Experienced Attorney Recruiting Contacts to learn more. Explore Seyfarth's 2014-2016 interactive Pro Bono Report — Focus on Philanthropy. Continuously strengthening a culture of inclusion.